The CDS combines the method-oriented research areas of data science and scientific computing with data- and simulation-driven domain sciences. 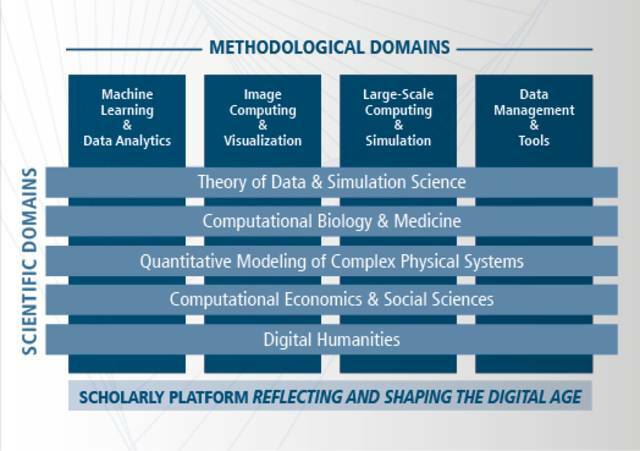 The four methodological domains constitute the central building blocks of the CDS. These are connected and integrated via five cross-sectoral scientific domains, which correspond to focal research areas of the UoC characterized by scientific excellence and a particular requirement for data-inspired approaches. Furthermore, the CDS is open to researchers from other disciplines to allow for dynamic growth and development. The organizational structure of the CDS is complemented by the scholarly platform Reflecting and Shaping the Digital Age. The platform provides an open space for the exploration of personal, societal, ethical, and legal implications of big data and transformation processes in the digital age.